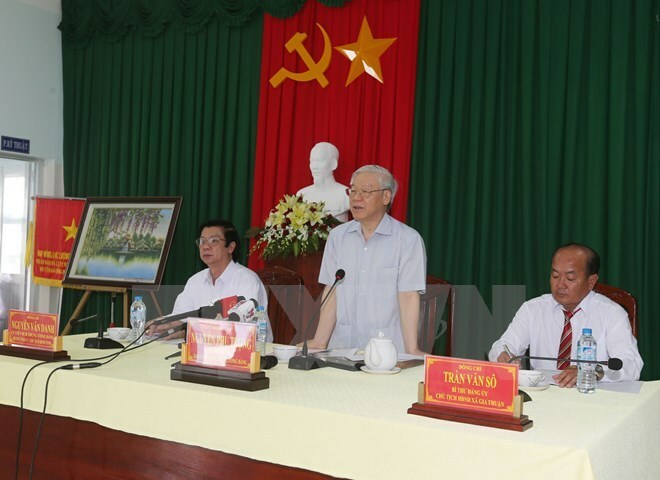 Hanoi (VNA) – Party General Secretary Nguyen Phu Trong hailed the Mekong Delta province of Tien Giang for its achievements fighting saltwater intrusion when he was on a working visit to the locality on March 16. Drought and saline encroachment have affected the Go Cong fresh water project, in which the Xuan Hoa sluice was shut down on January 5, two months earlier than it did last year, to protect 30,000ha of the 2015-2016 winter-spring crop. More than 500ha of winter-spring crop in coastal communes of Go Cong Dong district were killed before the Lunar New Year holiday. Thousands of households are without fresh water. The Tien Giang irrigation company - operator of irrigational facilities for the Go Cong freshwater project - assigned their staff to work around the clock to update the public on the situation through the mass media. The provincial Department of Agriculture and Rural Development’s Irrigation and Flood Prevention Branch deployed 16 mobile water pumping boats capable of pumping 32,000 cu.m of water per hour. Across the province, 21,600ha of winter-spring crop are being watered in 666 locations. Under the direction of Chairman of the provincial People’s Committee Le Van Huong, two water pipelines in Go Cong township were built quickly, easing the thirst of more than 5,300 households, not to mention another 7,000 households that benefited from 122 public faucets.